“While the capital was once in the forefront of managing air quality in the country, it has since lost ground due to a tardy response from policymakers. Things weren’t so bad a decade ago. 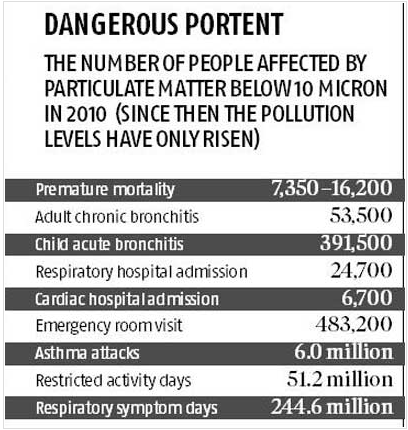 Delhi was seen as a leader, making rapid strides in managing an environmental menace that leads to the death of millions in India. ‘Delhi was doing almost as much as Beijing at one point till around 2010-11 in implementing the first generation reforms,’ says Anumita Roy Chowdhury, executive director, Centre for Science and Environment (CSE). ‘That advantage is now lost. We are behind Beijing on the second generation of much-needed reforms even though new science tells us that air pollution is deadlier than we had previously been aware of. But we are in business-as-usual mode now,’ rues Roy Chowdhury.” Business Standard. Read it on delhiair.org.